University of Aberdeen sought confirmation that the sitter in 'Portrait of an Unknown Divine' was, in fact, James Iverach (1839–1922). 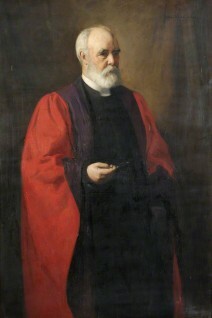 Andrea Kollmann suggested that the painting may be a portrait of James Iverach, painted in 1912.The evidence was circumstantial, but Andrea speculated that the artwork could have been painted by Allan Sutherland, and depicted a life-size representation of Principal Iverach, Aberdeen United Free Church College. Such a painting was described in the Aberdeen Journal, Saturday 6th January, 1912; Friday 28th March, 1913; and Tuesday 27th September, 1938. The subject was appointed Chair of Apologetics at the college in 1887 and stayed there for three decades. The portrait was then transferred from Christ's College to the University of Aberdeen. In support of this identification, Osmund Bullock provide newspaper cuttings from 1905–1922 about James Iverach, including an extensive obituary and photographic images that confirm the identity of the sitter. University of Aberdeen accept the identity of the sitter and the execution date. The painting is now titled James Iverach (1839–1922) and dated 1912 on Art UK. Could this portrait depict James Iverach (1839–1922)?